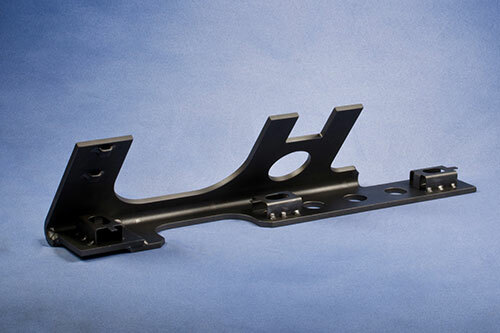 Dresco has been a leader in machining and manufacturing since 1981, and were chosen to take on the fabrication of this machine mount for an OEM machine builder. This piece of sandblasted high quality carbon steel was fabricated to be used as an internal mount on a extrusion machine. We employed a number of advanced processes for the fabrication of this product, this included waterjet cutting and saw cutting, welding, hydraulic press forming, and CNC milling. This piece featured multiple components and was manufactured to stringent standards for quality; comprehensive dimensional and visual inspections were carried out throughout production. 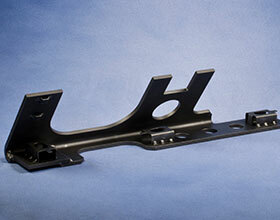 Over 300 of these components were manufactured for this customer in just 6 weeks. To learn more about how Dresco's highly skilled team can help with your specialized product, see the table below or contact us directly.